As beautiful as our city is, it's expensive. In fact Perth is now regarded as one of the most expensive cities in the world. However stress no more, because if you're looking for some retail therapy that won't hurt your back pocket, Harbour Town can help. Harbour Town is a two story shopping complex packed with big name brand outlets and tonnes of places to grab a bite to eat. It isn't huge, but you know what they say about quality over quantity. At Harbour Town, there's always a huge array of specials being offered, and it's not uncommon to be able to pick up your favourite brands at half price or more. Of course this varies store to store, so you might have to do some hunting around to pick up the best deals. My girlfriend and I usually head to Harbour town a few times every month and leave with more bags than we can physically carry. As a bit of a fitness nut, my favourite outlets are the Nike, Adidas, Converse, Levi's and Jim Kidd's. For the ladies I know that there's a Dottie, Cue, Intangible, Lorna Jane and Valley Girl just to name a few. Since there's way too many stores for me to list here, please click here to browse them for yourself. Located at 840 Wellington Street, West Perth, Harbour town is only a 20 minute walk from the CBD, and located close to public transport. If you choose to drive there, you can park at Harbour Town's double story parking complex, although you will have to pay an hourly fee. 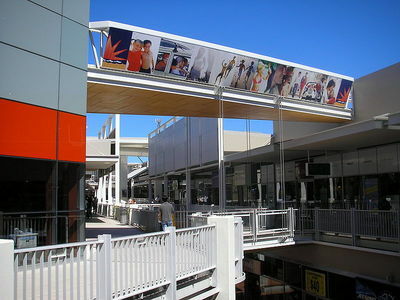 Harbour Town is the perfect outlet shopping centre for anyone who loves big brands at low prices. I wish we had more outlet shopping centres here in Perth, but Harbour Town is a pretty good start.